Skin Lesson Plan: What is Skin & How Does it Protect Your Body? This Back to School Science Lesson is meant to be a fun way to ease students back into their education. Use their summer experiences to expand on this skin lesson to make the transition a bit easier for them. Students often get more involved with animals of different types during the summer. This may be experience they have working at home with their pets, farm animals or by going to the beach and seeing different types of animals there. They may have even gone to the circus and seen some interesting animals! To begin with, ask students to write down five types of animals they had experience with over the summer. Students will likely have a variety of animal names to share. Going from student to student, ask them to each pick a different animal than the one before them ans describe it to the class. Some descriptions should answer the following questions. What type of out covering does the animal have? Does the animal live indoors or outside? What area of the world does the animal probably come from? Once students answer these questions, proceed to the next section of this Back to School Skin Lesson Plan. Ask students to look at their own skin and think about how it differs from that of the animals they saw over the summer. As they are considering this, write the categories listed below on your board. Explain each of the categories to the students, then ask them to place their listed animals in the proper categories. Discuss the purpose of outer coverings in general ways as in protection from the elements, assistance with homeostasis and the ability to recognize outside stimuli. 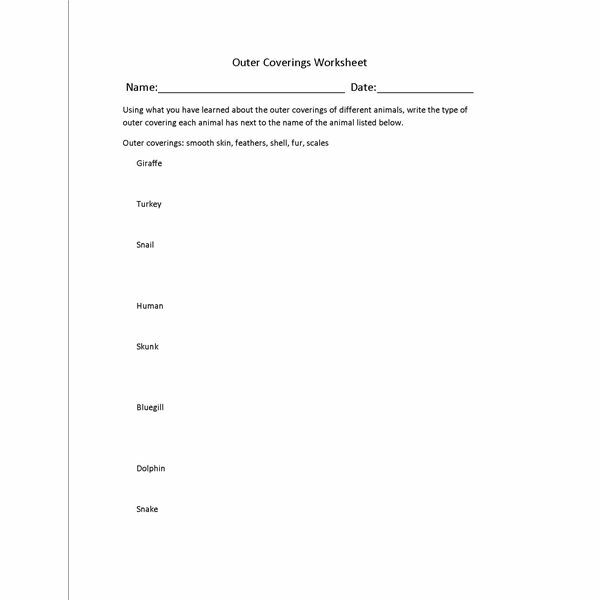 When discussing locations or atmospheres that animals live in, make the discussion interesting by talking about some of the benefits of their outer coverings, such as how feathers not only help birds to fly, but also provide insulation for them.Once the discussion is complete and you feel that students have grasped the concept of out coverings how they work for certain animals, provide them with the worksheet that is included with this Back to School Skin Lesson Plan. This worksheet is simply a written review of the material you have just covered. These are back to school science lesson plans meant to ease students back into learning by using interesting summer topics to reintroduce science into their lives.